You are at:Home»April»April 15»April 15, 1952: Greatest Bomber in History, B-52 Stratofortress, Makes First Flight! April 15, 1952: Greatest Bomber in History, B-52 Stratofortress, Makes First Flight! On April 15, 1952, a milestone in aviation history was crossed when the Boeing B-52 Stratofortress made its first flight! There is no typographical error in the date, it really was 62 years ago! The pilots flying the B-52 for the US Air Force were not even born then! Capable of carrying 70,000 pounds of bombs, including racks on the exterior of the airplane, the B-52 could fly at 650 mph at 50,000. Armed with .50 caliber tail guns, during the Vietnam War B-52’s shot down 3 pursuing jet fighters! The B-52, at 159 feet long and a wingspan of 185 feet, and weighing a maximum of almost half a million pounds was therefore (by far) the largest airplane ever to shoot down another airplane in combat! The B-52H model entering service in 1961 was equipped with a 20mm Gatling gun instead of .50 caliber machine guns, but all rear guns on all models were removed starting in 1991. The B-52 is crewed by 5 airmen, a pilot, co-pilot, navigator, bombardier, and electronic weapon systems operator. The B-52, or BUFF (Big Ugly Fat Fellow), used to carry a 6th crewman, the tail gunner, but of course with no tail gun, no tail gunner! With the development of effective ground to air missiles (SAM’s) the B-52 was forced to change tactics to fly at low altitude as fast as it could. Using water injection into its 8 jet engines, the sight of B-52’s on a penetrating run trailing 8 huge tails of black smoke is intimidating! The B-52 never yet has had to use nuclear weapons in actual combat, but has had plenty of use dropping mass quantities of conventional bombs, cruise missiles, and smart bombs during real combat. 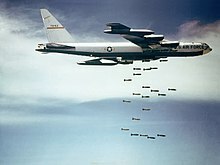 Viet Nam, Serbia, the first and second Iraq wars, and Afghanistan have all trembled under the might of the B-52. In Operation Desert Storm, B-52’s dropped 40% of all the bombs dropped during combat! Of the 742 bombers bought by the Air Force, 31 were shot down in combat and 85 remain in service today, and it was recently determined that they will stay in service until 2040 or beyond! Costing US taxpayers $14 to 53 million each, the B-52 seems like a bargain compared to the billion dollar B-2! Even the B-1 costs $300 million! The B-52 remains the biggest bomber ever made, and is likely to have the longest service life of any bomber in history. Whether dropping 120 500 lb bombs, nuclear weapons, cruise missiles or 30 2000 lb bombs, the B-52 is a massive and reliable projection of American military power. B-52 taking off from Tinker AFB. B-52’s have starred in books and movies, and of course, the rock group The B-52’s took us to The Love Shack! Incredibly, the common 1960’s beehive hair-do was called The B-52! B52’s have flown around the world non-stop with aerial refueling, and one flew from Okinawa, Japan to Spain un-refueled non-stop, over 12,000 miles! Do you agree with our statement that the B-52 is the greatest bomber? Let us know! Yenne, Bill. B-52 Stratofortress: The Complete History of the World’s Longest Serving and Best Known Bomber. Zenith Press, 2012.